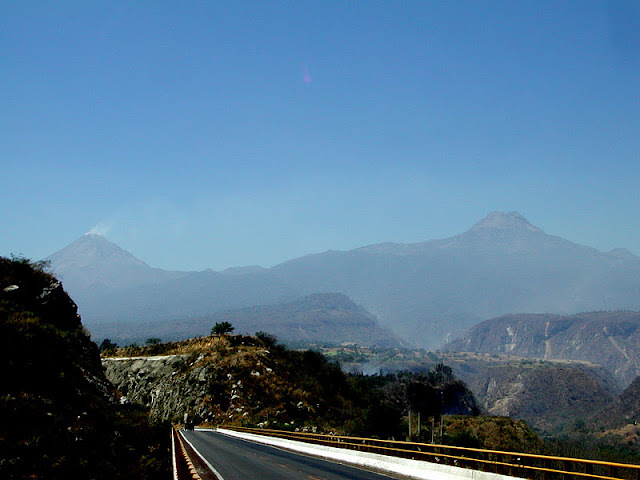 One last look at Puente Atenquique I, the very active Volcán de Colima, and the older, taller, and inactive Nevado de Colima. This is a very beautiful area. A cloud forest (Sierra de Manantlan) with an abundance of the world's flora and fauna is nearby. There are many quaint villages with cobblestone streets around ancient churches. And there are modern two-lane highways with 250 ft tall, incrementally launched bridges. Mexico's Bridges: Puente Atenquique 1 (5) by Mark Yashinsky is licensed under a Creative Commons Attribution-NonCommercial-ShareAlike 3.0 United States License.